As we’ve mentioned in previous blog posts and throughout the documentary ‘What’s With Wheat?’, there is a lot of research that links eating modern wheat with an increase in body inflammation, which leads to disease. We often hear from people who tell us how dramatically their health improves when they give up wheat. If you’ve seen improvements in your health and you want to share your story with us to inspire others to improve their health too, then please contact us here. 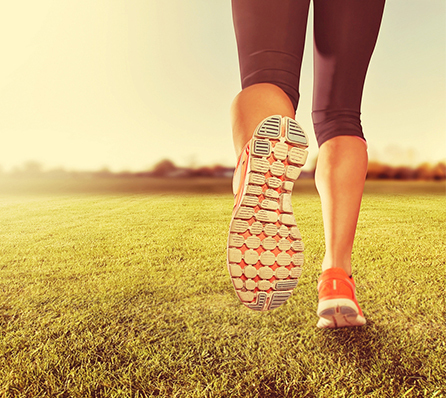 Below is the first health journey we want to share with you from Sue Moore… over to you Sue. Multiple Sclerosi is, an autoimmune disease that occurs when the central nervous system doesn’t recognise the difference between ‘good or bad’ cells, so it starts to attack itself. The protective sheath (myelin) around the nerve fibres in the brain and spinal cord becomes damaged, causing random patches called lesions. Imagine your myelin as the plastic coating around a bare wire, without the protective coating the wire is exposed and can get damaged. This is what was happening to my central nervous system. The recommended ‘medical treatment’ just didn’t make any sense to me, as it seemed like a ‘band-aid’ solution that addressed the symptoms, not the root cause. I was told that the ‘drugs’ might help to prevent future attacks but they might not. This seemed like playing Russian roulette to me; why would I choose to take a drug that might not even work, not to mention the side effects of the ‘recommended drugs’?. So instead I researched alternatives. I was inspired by Dr Terry Wahl’s health journey of beating progressive MS with Paleo principles, so I followed the The Wahls’ Protocol and gave up gluten, dairy and refined sugar; and started to get feeling back in my right foot and leg. I also started to feel better in myself; my ‘brain fog’ lifted, my concentration returned, my ‘sugar’ cravings and ‘sugar’ mood swings disappeared. Over the next nine months I retrained my body to not only feel my foot but to start running again from scratch. I completely overhauled my diet, improved my mindset, meditated daily, had regular kinesiology sessions and looked at my environment – removing all stress and negative associations in my life as well as moving to a warmer climate. During my morning meditations (Dr Joe Dispensa’s guided meditations), I imagined that I was in an appointment with my neurologist and we were both looking at my brain scans, before with eight lesions and nine months on with no lesions. In that scene, I was so pleased to hear the news and to see the clear scans. Every day, I repeated this scene over and over in my mind. I continued to nurture my body by developing a better understanding of my mind and body. I saw food as fuel, not an emotional crutch. For my running training, I ran when I could and walked/rested when I needed to. I defied the odds nine months later and completed my first marathon at Gold Coast, Australia in July 2015. 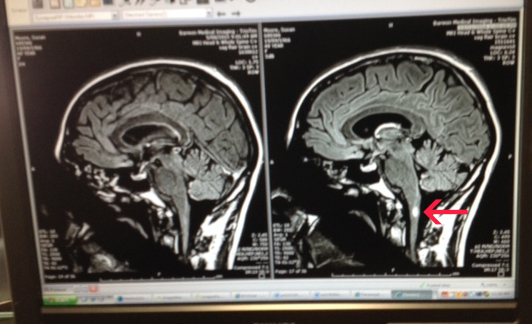 My follow up brain scans showed that most of my eight lesions on the brain had ‘completely disappeared and the few that remained had significantly diminished’. This was through NO medical intervention, just through eating a wholefood diet, meditation, internal belief, exercise and kinesiology. On the right hand image you see a spot which represents one of the lesions and on the left, it’s disappeared. When I watched the ‘What’s With Wheat?’ documentary, I realised the genetic connection as my Grandmother and Mum died of rheumatoid arthritis and my sister was diagnosed with Type 1 Diabetes aged 18. No medical doctor told us it was all genetically related, and they were all autoimmune diseases. Instead they medically treated each individual case in isolation. Since then I’ve continued to eat whole foods – I avoid gluten and refined sugar, balance my stress levels, meditate daily and enjoy life. My regular neurologist check ups still result in being ‘clear’. 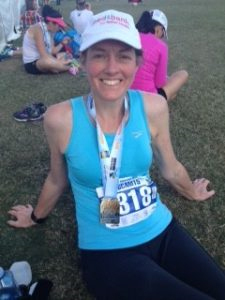 Thank you Sue, I’m sure you’ll agree that this is truly an inspiring health story – by improving a number of areas in her life she was able to reverse MS. Sue has recently published a book on Amazon, “Just Another 5km” where she describes her running training, her journey back to health and completing a marathon. If you have seen improvement in your own health after giving up ‘modern wheat’, however small and you want to share your journey with others to inspire them to better health, then please contact us here.